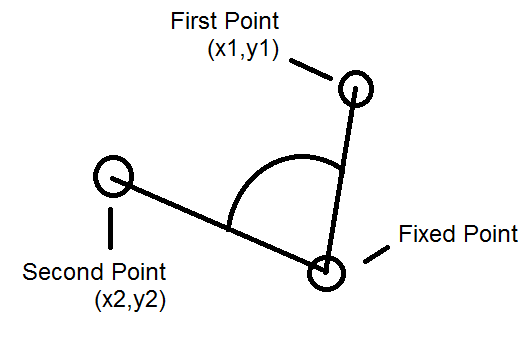 I need to calculate the angle in degrees between two points, with a fixed point that is connected with the given two points by a line. It's pointless to say that it doesn't provide the correct answer. Feel free to use Java's standard Point or Line2D classes in your solution though. This was just to demonstrate it works. Here is a code snippet from my Android Gesture library. It works and is fully tested. I don't know @user2288580 but even for simple, test-cases your code is failing. Not the answer you're looking for? Browse other questions tagged java lines angle points or ask your own question. How to calculate the angle between a line and the horizontal axis?